My paternal grandmother has thumbs so green mad scientists once cultured a new species of mutant mold off them. * Plants that are supposed to be annuals are so happy just to hang out in her basement that they’ll come back in the spring. The magnolia tree she planted in her yard in the late ’50’s promptly sprouted up into one of the largest specimens of that (gorgeous, fantatic) tree you’ll ever encounter. Any time you point out to her that something improbable and astonishing has happened with flora under her care she has a very simple, straightforward explantion for why it happened and has nothing at all to do with her. If you’d just seen one or two examples you might be fooled by this humble deniability. I’m nearly thirty and listen to family anecdata about times before my ken; I know better. Grannie’s got super powers. I, the oldest of her grand-offspring, have tried to honor the family line in my own way. I despise sunlight and hot weather, and I’m not a big fan of dirt, but I have massive appreciation for pretty gardens. Thrice now I’ve tried to get an herb garden growing in my office. I’ve blogged about this before. And thrice now I’ve gotten off to a good start only to have all the plants inexplicably keel over and die within a two-week window. This has happened whether I had them in the window or under a plant light, whether I watered them according to the indications on the packaging and described in gardening books and the internet or ignored them or over watered them on purpose, just in case. They die. Dead, deady ded. It’s…honestly, it’s a little embarrasing. I can’t sing to save my life. If I work really hard at it my drawing skills approach an incompetent middle schooler’s. I don’t even walk into a room with a sewing machine that’s going to do anything more complicated than a straight seam because it’ll seize up and break out of sheer paranoid fear at my presence. I’m no stranger to skill sets that I just won’t ever master, and I’m okay with that. Much as I’d love to be an awesome artistic rock star who designs her own fabulous costumes, I also don’t really have time for it, either. But the gardening? Am I really so bad at this that I can’t even keep mint alive? Mint, a plant considered a weed in many circles; I’ve killed it four times. (There was an outdoor herb garden attempt that went badly, as well) Is it possible that the secret to Grannie’s super power is that she sapped the skill from future generations and kept it all to herself? This brings us to last week, the Wednesday before Christmas. Packages have been arriving with some regularity, for it is the season of getting to know your mail man. (I actually know my mail man anyway – he’s a nice guy and finds my tendency to be building bookshelves or taking apart snowblower engines in the middle of the day bizarre and amusing) On that particular, special day, a package arrives for me and it’s not from Amazon, which more or less obscures what the contents are. No, this box is direct from the vender, and it’s an item I suggested to my grandparents with an intense hope that they’d run with it. Love at first sight doesn’t exist, but unbridled enthusiasm at first de-crating is very real. 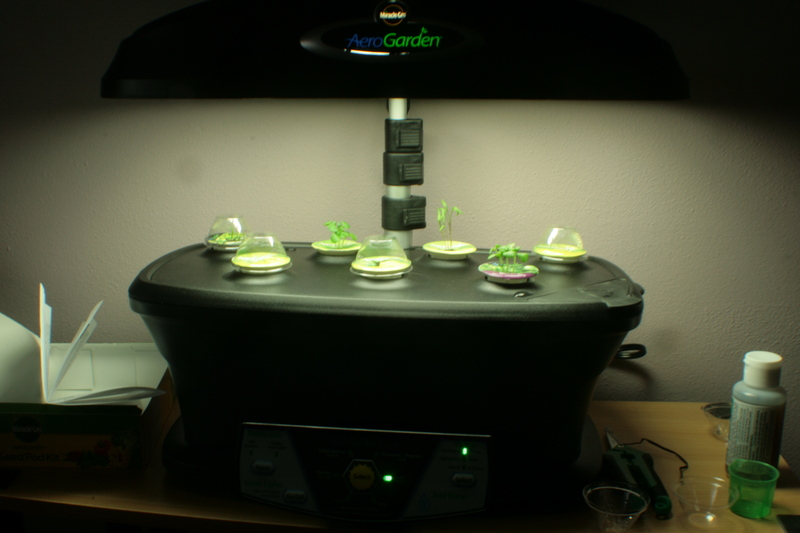 I immediately named the Aerogarden Foy, after Grannie. And then, because I will never survive the shame involved in killing the plants in an Aerogarden, I read ALL of the instructions. This is about the time I started squeeing with enthusiasm about Foy on Twitter. And then patting myself on the back for getting my enthusiasm to fit into 140 characters. Thrice have I planted an herb garden in my office. Thrice have I watched it shrivel and die. Because I’m salting my own soil. We’re ten days in and things are sprouting faster than indicated on their labels. All the tiny little plants are super cute and happy looking. I think the fourth time just might be the charm. And I’m going to try a new pot with rosemary set up next to Foy to see if maybe, now that I won’t be salting it, it’ll take off and be happy. I am so excited. Methinks I’ll be thanking Nannie and Pappa for this for weeks, and possibly gloating triumphantly to Grannie a bit, too. I mean, sure, this is nothing compared to ressurecting orchids by being near them, but I caused tasty, edible life by pressing buttons and obeying blinking lights. I am like unto God! Or, you know, a minimally competent American adult. You forgot the part about her self seeding red maple, which doesn’t exist outside of her property. Also, I was going to say something snarky about other things you can’t do, but the overwhelming truth to what you’re saying about Granny is too important to detract from and I will simply agree with you on her magical abilities.